The best part of Zareer Masani’s memoir, And All is Said, on his late parents – Minoo Masani and Shakuntala – is the candour with which he tells the story of their tempestuous lives. Minoo Masani’s escapades with various women are described in detail, as also the very colourful life his mother had led, with several interesting relationships. The most interesting one is, of course, her friendship with J.R.D Tata, and one wishes there were more details! In his long and eventful political career, Masani had several important postings, and when the author was only six months old, his father got a one-year diplomatic posting to Rio de Janerio. After making an important contribution as Member, Constituent Assembly, Masani dropped out of politics in a year “disillusioned with the pro-Soviet and statist slant Prime Minister Nehru was giving the county”, and was posted as India’s first Ambassador to South America. But then if she flirted with several men, Minoo Masani was her match. His first wife was an Englishwoman, who he lost to another man. He himself, the author tells us, “was irresistible to women for most of his long life. He was tall, with an agile, lean physique; he had strong features – a wide brow, a bow-shaped sensuous mouth, an aquiline Parsi nose, a square jaw and a firm, dimpled chin”. 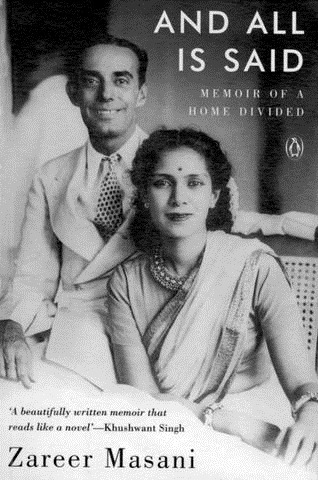 The account of Minoo Masani’s second marriage is replete with anecdotes of a hilarious, triangular relationship he got involved in, complete with court cases. He met Shakuntala, who eloped to Bombay to get away from the clutches of her tyrannical father, and was immediately attracted to the “fresh, innocent and very pretty” young woman, and found her a job in the Free Press Journal. Zareer Masani, who admits being much closer to his mother than father, has sketched a much more evocative portrait of her. The book begins on a poignant note — the son returning to India with his mother’s ashes in a black box that weighs barely a kg. “In life, she travelled anything but light”, he notes, adding that as her summer migrations to London grew longer with advancing years, her baggage got heavier despite airline restrictions. But she could charm her way with her excess baggage and even get free first class upgrades! 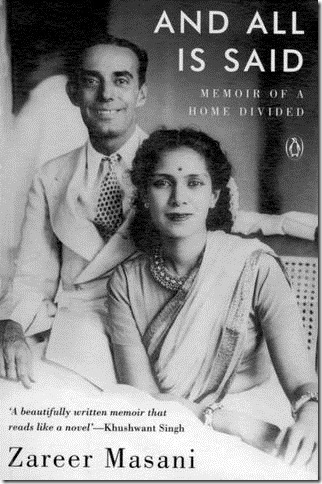 After the funeral in India – a hilarious account of family politics and the pundits and their shenanigans — while going through his mother’s belongings, the author finds a huge treasure trove of her letters and diaries and much of the memoir is constructed around those letters, many of them written in fluid and flowing prose. The book also gives us an interesting account of the political scene in India in the 1960s and till the Emergency. The couple had political differences; Minoo Masani broke away from the Congress to form the Swatantra Party, while she remained a Congress loyalist, and their marriage ran into deep trouble. Their very different family backgrounds – he came from a scholarly family which scorned wealth and its attendant comforts. She was the daughter of Sir J.P.Srivatsava, a British loyalist, and used to a pampered lifestyle. In 1971, Shakuntala joined the Congress and Indira Gandhi swept the elections; among the Opposition stalwarts who fell was Minoo Masani, with the Swatantra Party decimated.